I have a new cat and a new camera, so if you don't like cat pictures you better run. When they call your cat's name, that means you can go in. It is not necessary to protest that you had a 4:30 appointment and should go in next. Covering for the misunderstanding by snapping that you've been waiting so long you forgot your cat's name will not convince anyone, particularly when it's only 4:45. Admittedly, those people did wind up waiting a few extra minutes while the staff kindly ran Jordan's bloodwork right away instead of having me call for it the next day as usual. 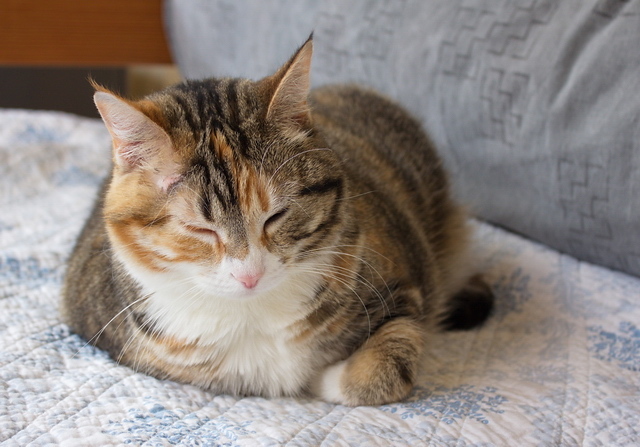 I was grateful because I've been really worried about her, but the news was as good as it could have been: ten days on subcutaneous fluids have brought her kidney numbers down significantly. She's also maintaining her weight, thanks to a passion for dry food that illness doesn't seem to blunt. She's still a 19-year-old cat with bad kidneys, but considering that, she's holding up pretty well for the moment. 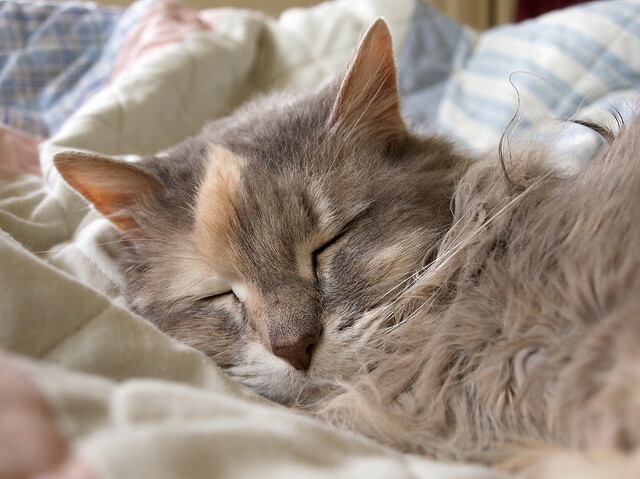 These photos are from last year, and while I don't remember the occasion, I believe they show Jordan taking a well-earned nap after an intense grooming session -- hence the spit curls in her ruff. Jordan is a cat with very definite ideas about her place in the world. If I'm lying on my side, her place is lying against me. If there's a book there, she'll lie down on top of it. Luckily, she's okay with having the book put down on top of her instead. 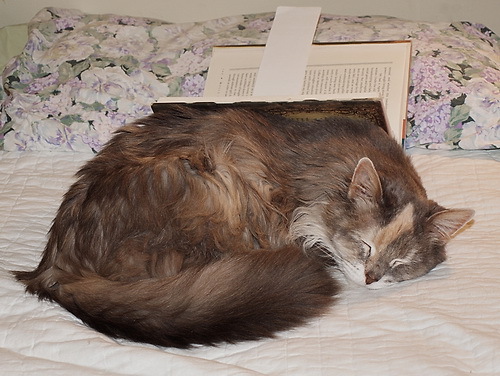 Sometimes a cat head will appear on the edge of the page, which means that petting is required in order to read further, but after a while she will happily curl up and go to sleep in bookrest form. As long as she's in the Right Place, it's all good.